Good Friday schedule of events: Confessions from 8 am - 2 pm; Stations of the Cross at 12 pm; Veneration of the Cross at 3 pm; Divine Mercy Novena after Veneration. Fasting and abstinence today. The Catholic Church is the largest Christian denomination in the United States, accounting for about 25 percent of the country’s population. As the Church continues to grow, there are many people, who for one reason or another, have stopped actively participating in the life of the Church and attending Mass. More than ever, people need God, but sadly, many have lost sight of the treasures of the Catholic Faith. We can see the reality of our fallen-away brothers and sisters not only in our nation as a whole, but even in our own families and neighborhoods. The evidence is shocking. Only 24 percent of U.S. adult Catholics attend Mass on a weekly basis. The number of Americans identifying themselves as “unaffiliated” with a religious tradition (whether atheist, agnostic, or “nothing”) is increasing and as many as 100,000 baptized Catholics are drifting away from the Church each year. Evangelization is critically needed now! Perhaps you or someone you know are in this situation and do not know how to come back to the Church. The first thing you need to know is that you are always welcome back. The Church misses you and hopes that you will choose to come home as an active member. To help people with this journey there's Catholics Come Home, an independent, non-profit Catholic apostolate that creates effective and compassionate media messages to inspire, educate and evangelize inactive Catholics and others. Catholics Come Home 's informative and interactive website helps to answer questions about Church teachings and gives an overview of the Catholic Faith. Some of its founders and supporters recently returned to the Catholic Faith and want to share their positive experiences with others. Many never left the Church, but recently grew to understand and appreciate their Catholic Faith more deeply. All feel part of a big Catholic family, who sincerely hope others will also find more peace, real answers, and true happiness through the gift of faith. 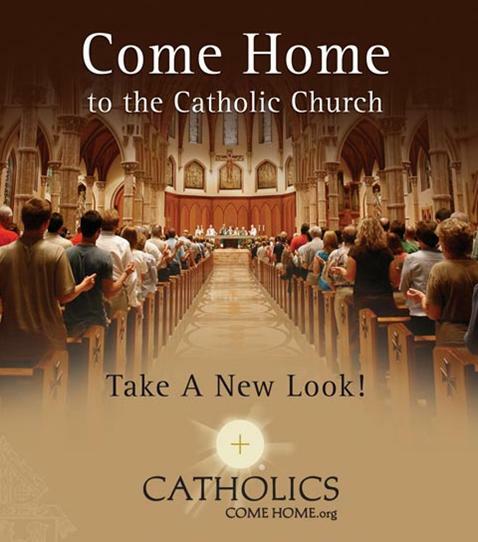 Take some time to check out Catholics Come Home. The stories from former fallen-away Catholics testify about how the world and other life situations drew them away from their Faith, but by God’s grace, they felt a tug at their heart inviting them home to their family in the Church. We hope that their stories will encourage you, and will serve as your own personal invitation to come back to the Catholic Church. Jesus and your fellow Catholic brothers and sisters are waiting with open arms to welcome you home. Tell me more about Coming Home? Catholics Come Home is working to bring about a powerful, positive change in our modern secular culture and is inviting fallen away Catholics to return to their Catholic Faith. How can Coming Home help me? Through Catholics Come Home you will discover why it’s worth returning to the Catholic Faith, no matter how long you’ve been away or what’s happened while you’ve been gone. God will never stop searching for you. Non-Catholics who have explored the Catholics Come Home site are often surprised to find out that there is much more to Catholicism than they ever realized. Check it out. You have nothing to lose. We’re glad you’re here. What if I'm not really religious? How can I help my family Come Home? Learn how to help your loved ones come home to the Catholic Church, as well as learning how you can participate in helping countless other souls return to Christ and the sacraments. How can I help my friends Come Home?